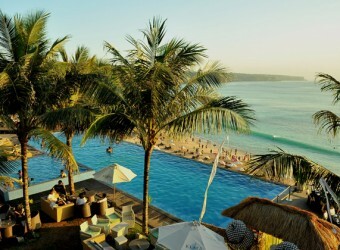 Bali Klapa Restaurant is located at beautiful Dreamland Beach Jimbaran which was opened in 2009.The restaurant is large, you can enjoy delicious food at indoor or outdoor seats. Swimming pool facility for both adult and children is available. Location of the restaurant can be one of recommended points. It is built overlooking Indian Ocean, sunset time can be fantastic sight.